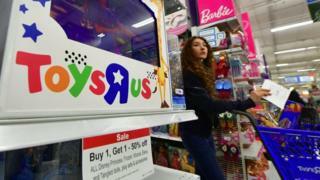 Toys R Us is set to close or sell all of its 885 stores in the US in the coming months, the BBC understands. That move would put about 33,000 jobs at risk. The giant toy-store chain was already in the process of closing one fifth of its shops as part of efforts to emerge from one of the largest ever bankruptcies by a specialty retailer. Toys R Us said earlier that all its stores in the UK will close in the next six weeks. “I have always believed that this brand and this business should exist in the US,” chief executive David Brandon said on a conference call with staff, the Wall Street Journal reported. The retailer is likely to go into liquidation in France, Spain, Poland and Australia, Brandon said, according the newspaper. He added that Toys ‘R’ Us also planned to sell operations in Canada, central Europe and Asia. There were reports the toy chain had stopped paying its suppliers earlier this week, the Washington Post reported. The business was bought in 2005 by a group of investors, including private equity firms Bain Capital and KKR, which loaded it with about $5bn (£3.6bn) in debt. The company was landed with interest payments which at times reached $400m a year. In the UK Toys R Us joins a long list of high-street retailers, including Maplin and Claire’s, that have run into difficulties this year. Many have been hit by changes in consumer spending habits, a squeeze on disposable income, higher inflation and the extra cost of the national living wage, and the prospect of increases in business rates in April.